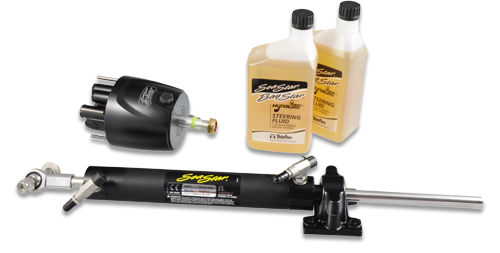 SeaStar Inboard Steering Systems are engineered and manufactured for all Pleasure and Work Boat applications up to 50ft. with some exceptions. See the Application Guide below for specific details. For Commercial and Work Boat applications over 50ft. (11.5m) and Pleasure Boats not included in the Application Chart below please refer to our Capilano range of Inboard Steering Systems. • Regular duty aluminum cylinders. • Heavy duty brass cylinders. • Easy installation for single and dual rudder vessels. • Cylinders supplied with bleeder fittings. 2. From the Order Guide below select the appropriate helms and accessory hardware for each steering station. 3. From the Order Guide select the fitting and hose kits required for the installation. b) the dash area for the steering components. a) Displacement Hull – maximum hull speed does not normally exceed 18 knots. b) Planing Hull – maximum hull speed normally exceeds 18 knots. DESCRIPTION QTY. REQ. MODEL PART NO. 1. For systems 1, 2 & 3 – nylon tubing (3/8″ diameter) is the standard requirement for plumbing the system. Copper tubing (3/8″ diameter) can be substituted but Fitting Kit HF5507 is required. 2. For systems 4 & 5 – copper tubing (3/8″ diameter) is the standard requirement for plumbing the system. Fitting Kit HF5508 is required. 3. For systems 1, 2, 3, 4, & 5 SeaStar outboard hose can be substituted for nylon or copper tube. These hoses must be ordered in standard lengths. They cannot be cut to length.